It was a sensational discovery, when in 2012 fragments of the 1,200-year-old parchment were rediscovered in a box. The original was cut up in the 18th century and used as covers for other books. Six years ago, the fragments were found in the library of Admont Abbey and its value was recognised. Currently the fragments of the “Admonter Abrogans” are being presented in a special exhibition in the abbey. The cultural treasures have been made accessible through a multi-media presentation, which staff members of the Institute of Creative\Media/Technologies at St. Pölten University of Applied Sciences have designed. 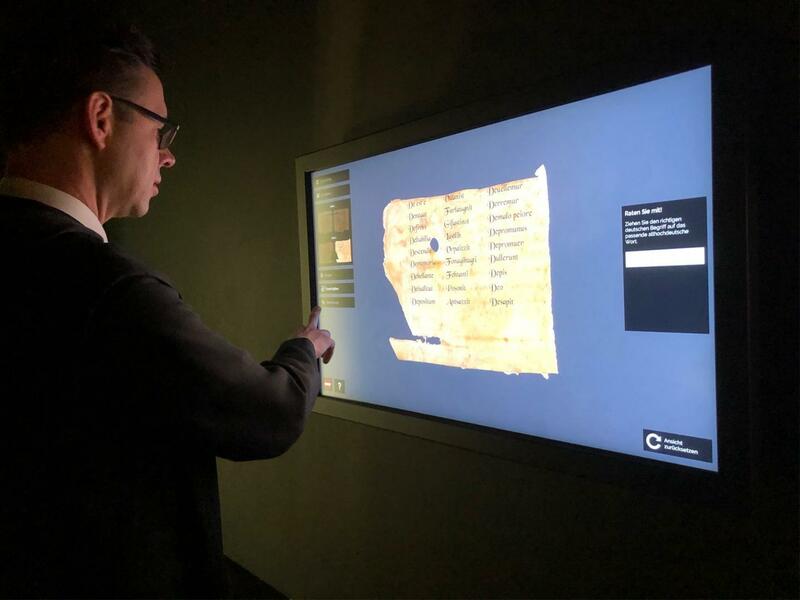 Visitors can zoom in on high-resolution images of the fragments, obtain background information on the details of discovery, display translations in Modern High German and other languages or guess beforehand which current term matches the Old High German original. Smartphones, touch screens and holograms could make museum visits a digital and multimedia experience. For example, books that for reasons of protection may not be touched by visitors, could be leafed through on tablets. Or flesh and skin could be projected on the skeleton of a dinosaur with virtual and augmented reality. The research project MEETeUX (Multi-Device Ecologies Towards Elaborate User Experience), coordinated by St. Pölten University of Applied Sciences, develops approaches and solutions for digital forms of exhibition design. The presentation of the Abrogans is a first prototype from the project. “For a meaningful and integrated future use of smartphones, tablets and touch screens or modern media technology such as augmented and virtual reality in semi-public areas, for example, exhibitions and museums, there are currently no well-tested concepts for the design of interaction and user experience for end users”, explained Markus Seidl, Head of the MEETeUX project as well as the Institute of Creative\Media/Technologies at St. Pölten UAS. However, this knowledge is important in order to make the technologies as low-threshold as possible and accessible to all. This is exactly where the MEETeUX project starts. The focal point is on research at the interface between man and machine for interaction-design and the experience for users. “Smartphones could be used as a ‘magic lens’ like a magnifying glass. As soon as one is near a station, certain information could also be played automatically as a 360-degree-video or audio presentation; or exhibition visitors can work together with collected objects and information to solve a puzzle”, said Seidl.